Kristen Stewart MTV Video Music Awards Appearance – Her Special Demands Revealed! So what’s a fallen star to do? The answer is that Kristen had to get back up and promote herself – after all there is no love like self-love. So Kristen had to make a choice whether to bury herself in Kleenex and seek obscurity or get up and back out there into limelight. Kristen will be appearing at the MTV VMA show but as we learn only with special conditions. Mike Walker in The National Enquirer Print Edition, September 3rd itemizes the stringent conditions Kristen has demanded for her appearance: Kristen Stewart is terrified of getting booed and heckled at the MTV Video Music Awards – and she started driving producers batty with new demands, which include: (1) ‘Nobody can make fun of me!’ Host comic Kevin Hart CANNOT crack jokes or many ANY mention of her cheaty-cheaty-bang-bang triangle with Rob Pattinson and married ‘Snow White’ director Rupert Sanders. (2) Ditto all that for ALL presenters. (3) NO red carpet walk! (4) A special security squad will whisk her through secret passageways to avoid angry R-Pattz fans. (5) She will not sit in the audience ever. She will appear onstage, then leave the building immediately. 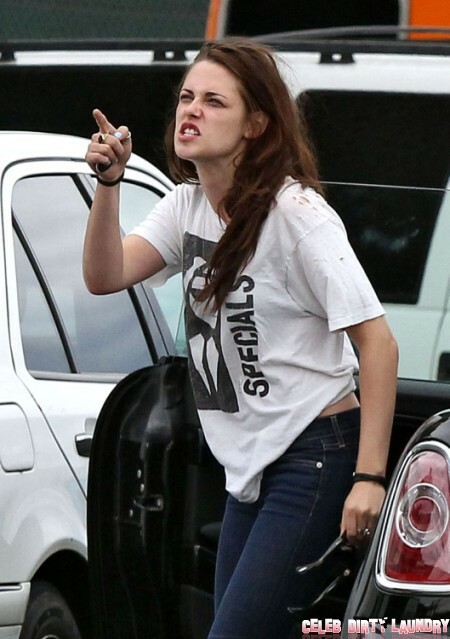 CDL Contest: Send us your Video Reactions to the Kristen Stewart Scandal — WIN a Super Duper Celebrity Prizepack!